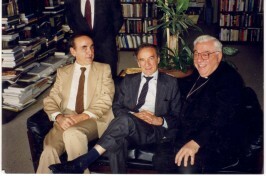 Elie Wiesel, Cardinal Antonio Quarracino and Baruch Tenembaum. As a member of the Raoul Wallenberg Foundation, he offered us guidance and support in our quest to recognize the rescuers and instill their spirit of solidarity in the young people. Through his endless books, publications, conferences and interviews, he epitomized the triumph of the human spirit over evil. His articulate speeches and writings reverberate in the whole world and represent a clear and loud voice against racism and all types of injustice and oppression, regardless of the religion, nationality or background of those who suffer any kind of persecution. He was rightly recognized with the highest accolades and honors, including the Nobel Peace Prize and his voice became intimately identified with the civic courage and compassion espoused by Raoul Wallenberg. In a joint statement, Eduardo Eurnekian and Baruch Tenembaum, Chairman and Founder of the Raoul Wallenberg Foundation, stated: “Elie Wiesel was a prolific author and educator, a world-known human rights activist but, above all, he was a source of inspiration and hope. We are proud to have had him as a spiritual mentor and friend and shall do our utmost to keep alive his legacy. Mr. Wiesel was a remarkable human being who rose from the ashes of the Holocaust and despite his personal tragedy, he believed in mankind, underscoring the recognition we all owe to the rescuers. Mr. Wiesel will live in our hearts forever. May his memory be blessed”.